So, why is your hair blue? I have heard time and time again, ads on the radio for secret keeper girls. I have never been able to take Allie due to my work schedule. This has always bummed me out. This past summer, we were driving home from a trip through Beaufort (i think), and I heard an ad on the local radio for secret keeper girls. It suddenly dawned on me and I have no idea why I had never thought of this before, but why not go to the website and check for shows that would be on my night off and would be do-able for a day trip. We were blessed to find a show on a saturday night that was in Myrtle Beach, so I immediately bought tickets. I knew that it was called the crazy hair tour, but that was about all I knew. I began to pour over the website and social media to get an idea of what to expect. Allie was excited and we began to plan what our crazy hair would look like. I gave Allie the freedom to choose. We would dye our hair any color that she chose. She was allowed to dye streaks in her hair and I told her that I would dye the tips of mine, so that I could easily cut it out after the show was over. She chose blue. I showed up at this event thinking that I knew what to expect. I knew that it had a fashion show and I knew that they talked about modesty. A few hours of this with some Jesus mixed in and my Allie….that was what I was anticipating. I was so thoroughly impressed by this event. I cannot even say it enough. If you have a daughter, granddaughter, niece, kid down the street….any girl in your life….take them to one of these events if you get the chance. The target ages are 8-12 years old. It was the absolute perfect combination of worship, games, audience interaction, Bible verses/teaching, stories, videos, competitions, prayer, fashion, and just girl time. I was texting my husband during intermission saying “oh my gosh, this is soooooo good”. They kicked the event of right with laughs and some worship time. I LOVE worship time, so I was hooked in the first 20 minutes. They even took the time in the second half to share about how they do free events in not so great areas where the girls probably need to hear the message the most, yet would not be able to afford the ticket. After watching the video, they passed around a bucket for offering and also said that you could become monthly partners to help put on these shows. I had already pulled out a couple of dollars to drop in the bucket- I wanted to set a good example after all. Allie looked at me and said she wanted to become a partner. she wanted to help those girls be able to go to the show. I had to really bite my tongue, because I am ashamed to say that my first instinct was to say no and come up with an excuse. That is just going to give us another bill…. or the infamous : let’s pray about it and we can always sign up later. In that split second I was corrected by the Holy Spirit. Had I not been texting how amazing this event was? Had I not just spent more than a months pledge on our dinner? That is one meal versus possibly forever changing a little girls life. Shame on me. We had spent more than that on gas to drive to myrtle beach. I checked in with Otis and we signed her up as a partner. I believe without a doubt that even just getting the monthly statements in the mail will keep this ministry fresh in our minds and keep Allie praying over these girls. Another sweet moment was during the fashion show. It was teaching the girls how to adjust the styles that were in to be more modest. For example, tank tops under shirts that may be too low-cut or too short….adding leggings to skirts that might be too short. These were all great examples that we did at our house, but I sure appreciated her hearing it from someone else beside ‘the parents’. They also taught some tests to tell if you outfit was not modest- this caused some laughter, but taught valid tricks that we have already used on a Sunday morning! During one of the more serious moments when they were teaching about how it was ok to not give in to the pressure of society to look or act a certain way. The leaders had all of the girls close their eyes. They told them to place their hands over parts of their body that they struggled with or wished they could change…..and then they began to pray over these girls. Pray that they would find their identity in Christ. Here’s my confession…. I totally peeked. Honestly, I wanted to see if and where Allie had her hand. But as I looked around this room full of sweet 8-12 year olds, I was amazed at what I saw. These beautiful girls had hands on their hair, their stomachs, their legs, even some on their noses. That just breaks my heart! Who planted the idea in their mind that they were not good enough!? Who fed lies to their hearts saying that they had to look a certain way?! Be protective mommas, if you aren’t watching out for your sweet girl then who is. Watch what television shows they are watching and who they are idolizing. What kind of clothes are you buying for them? is that sending them a message as to how they should look? or how much effort they should put into trying to fit into the mold society gives us? Even the friends that they are hanging around. I have mentioned in previous posts that a big theme this year in our home has been teaching Allie the difference between a friend and an acquaintance. Believe me, there are lots of 10 year olds that are acting like 13 year olds, dressing like 15 year olds, and wearing make up like 17 year olds. We also need to keep in check the example that we are setting for our girls. Do you downgrade yourself constantly or obsess with calories/dieting/pills? What do you think that is teaching these kids that are watching every move we make and hearing every word we speak? Be aware moms, of the effect that your words and actions are having on the next generation. Well, that event was two week ago. I still have my blue hair….haven’t cut the ends off yet. I have had about a dozen people ask me why wouldn’t I have just used the wash out stuff or spray…why would i actually dye it blue!?! Well, what fun would that be!! 🙂 I am going to take every chance I get to make memories and strengthen bonds with my kids. 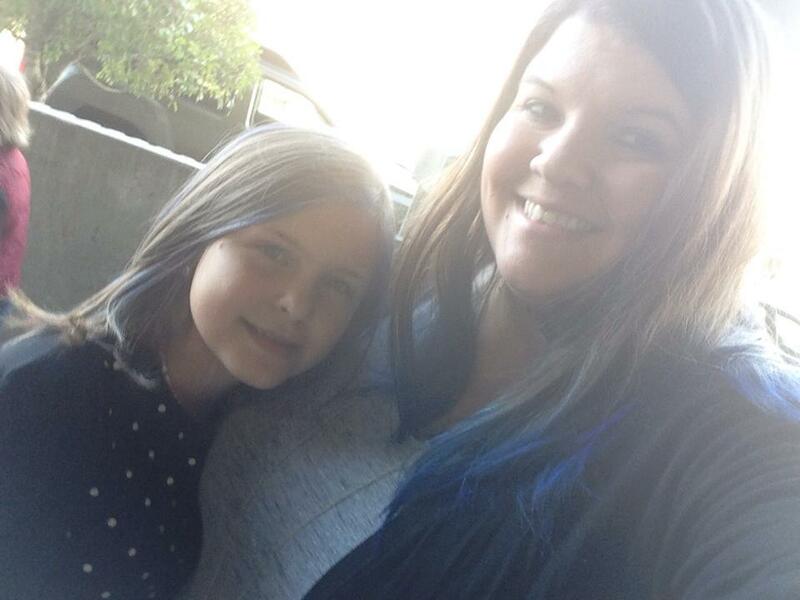 To me, blue hair is a small price to pay for making memories with my girl. Don’t let these years pass you by, if you don’t take the time to care about what they say now…they are not going to care what you say later. I love my sweet Allie and thank God that I was chosen and blessed to be her mommy. 1 Response to So, why is your hair blue?